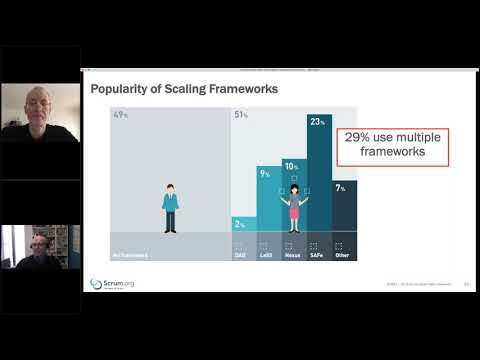 Scrum is not a methodology, but a framework. There are no rules that apply to every scenario, just best practices that have worked in other organizations before. Hence, you have to figure out on your own what is working for your organization–which is a process, not a destination. In this model, product discovery is moved as far as possible to the left to keep costs of validating hypotheses — derived from a vision and strategy — low and increase the speed of experimentation. In this approach it is crucial that the Scrum master coaches the scrum team to adopt such a holistic model, some call it dual-track agile, as well. Therefore, the PDF contains additional background and contextual information, how the following set of questions can be interpreted as well as guidance on desired or acceptable ranges of answers for each question — based on such a holistic model. The questions themselves are grouped into seven categories. Why the questions are useful in the process. A range of appropriate answers. Two to three questions from each category will provide more than enough ground for an engaging 60 min conversation. The Manifesto for Agile Software Development. 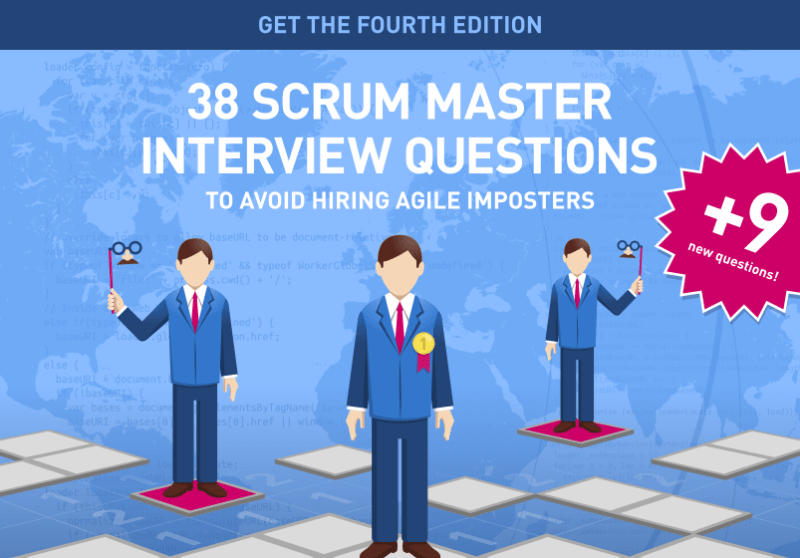 The 2018 edition of “38+9 Scrum Master Interview Questions” is out now. It was revised, plus we added another three questions on scrum anti-patterns as humans — including scrum masters — are fallible. Please note: It would have been easy to add more than three questions from the “Scrum Anti-Patterns Guide” to this fourth edition of the scrum master interview questions guide. However, talking about scrum anti-patterns during an interview is one thing. Observing them during a trail day, for example, is something different. The more questions on scrum anti-patterns are listed in the interview guide the more likely they will serve as a checklist for a candidates qualification. That is not the intended purpose. If you are a subscriber to the newsletter, you do not have to do anything: I will email the new version to you. The 2017 edition of the scrum master interview questions is now available. It was completely revised, plus we added another six questions on agile metrics, and on how to kick-off a transition to scrum. The authors share a holistic view of agile methodologies: agile equals product discovery (what to build) plus product delivery (how to build it). You will have by now received an email including a download link for the latest PDF unless you unsubscribed from the newsletter at an earlier stage. If you did unsubscribe, just download the PDF again using the form on this page (see below). The Agile Manifesto says "People over processes." Isn't the Scrum master – a role to enforce "the process" – therefore a contradiction? Your team's performance is constantly not meeting commitments, and its velocity is very volatile. What are possible reasons for that? And how would you address those issues? The Product owner role is a bottleneck by design. How can you support the Product owner so that she can be the value maximizer? How do you ensure that the Scrum team has access to the stakeholders? How shall a good user story look? What is it's structure? Why aren't user stories usually simply estimated in man-hours? How can you as a Scrum Master contribute to the sprint planning in a way that the team is working on the most valuable user stories? How much capacity would consider being adequate for refactoring, fixing important bugs, exploring new technologies or ideas? Who shall participate in the retrospective? What retrospective formats have you been using in the past? How can you prevent boredom at retrospectives? Are there any standard metrics that you would track? If so, which metrics would you track and for what purpose? Your Scrum team is consistently failing to meet commitments, and its velocity is volatile. What might the possible reasons be? How would you address this issue with the team? What qualitative agile metrics would you consider tracking? How would you prepare to kick-off transitioning to Scrum? How would you create the first Scrum team? What do you recommend a newly formed Scrum team works on first? 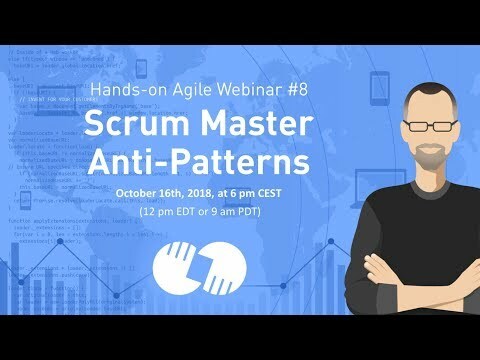 What anti-patterns might a scrum master fall into during a sprint? What anti-patterns do you know of that can happen during a retrospective? How can you (as a scrum master) identify where you need to improve? Scrum has always been a hands-on business, and to be successful in this, a candidate needs to have a passion for getting her hands dirty. While the basic rules are trivial, getting a group of individuals with different backgrounds, levels of engagement and personal agendas to form and perform as a team, is a complex task. (As always you might say when humans and communication are involved.) And the larger the organization is, the more management level there are, the more likely failure is lurking around the corner. The questions are not necessarily suited to turn an inexperienced interviewer into an agile expert. But in the hands of a seasoned practitioner, they support figuring out, what candidate has been working the agile trenches in the past and who’s more likely to be an imposter. Darrell, I think it is unlikely that you will be hired as a scrum master or agile coach right away. Try and become a member of a product development team in whatever capacity first to learn more about how all of this works. Great information, but yes, how does someone break into Agile and become a Scrum Master? I immediately received a CSM, and now studying for PSM. Yes, means nothing as I come from an apparel manufacturing background. I love the Agile process and the people it creates. How do I get that first Scrum Master job to build experience? Thank you so much for pointing at it — what a blunder! We will fix the 2018 edition that should be available in early January 2018. Thanks for this useful book. I’ve noticed one controversial issue. But ‘definition of ready’ and ‘definition of done’ it is absolutely different things. Mayby, you meant another. Could you explain, please? Hi Arian, I get the point. Let me briefly sketch the background of the document. It resulted from a Scrum Master recruiting effort for one of my clients. Here, the team in question was involved in the interviews, however, at a level that required to split questions among interviewers. The questions were primarily used to filter those candidates that had no previous experience with Scrum except for a certification, and – say – ten years of PMO practice. (Who, nevertheless, believed that they would be able to master agile software development with Scrum.) Those turned out to be a waste of time as they had the wrong mindset. And junior Scrum Masters, of course, we all need to start somewhere, were not suited for the position due to the complicated stakeholder situation. Hence “imposter” is applied to the first, not the latter category. While its great what you have done, I have a question for you. How do you propose then to get new blood, new Scrum Masters? Assuming that a person have not worked on IT before but would like to move into that direction. After all scrum is not a framework that is specifically made for IT, but it seem that its been embraced widely by the software companies and we all know why. We all know that technical minds are not the best in leading in general. My apology Armando that it took so long! ● The Scrum team is involved in the product discovery process at an early stage. My name is Ali Mohammed and I am an IT Recruiter. I had submitted one of the resumes for the position of Scrum Master. The resume had been shortlisted and the manager asked for an interview. I shared your PDF with him and we discussed a lot on this. He’s been selected and the client raised the offer against him. Please read the whole text: “Imposter” refers to project managers, who believe that reading a Scrum book, or attending a 2-day class qualifies them as a Scrum master. Inexperience does not an imposter make. And how is one supposed to become a veteran, then? Good set of questions. Can i also get the answers for the same. Hi Naveen, is the download not working? May I request the pdf with answers to above questions over email? Nice list of questions btw. To which one are you referring: PO interview questions v1? That’s almost ready. Or v2 of the SM questions? Thank you for your work and help the community with your contribution. I think that this document can be useful for many people helping to be more rigorous in their hiring processes, but I noticed that in the document, when mention “Scrum Team” is meaning “Development Team”, because “Scrum Team” consists of a Product Owner, The development Team and a Scrum Master. They will be available shortly—stay tuned! Ginger, the next version of the PDF will also includes answers. All subscribers will automatically receive it by email. Can I also get the answers to these questions? Appreciate if you can post the answers for the above 38 questions. Absolutely! I can provide you with a Word file by email, if that would ease the process. We would love to use this Article on our new AgileCareers Blog (coming soon)! AgileCareers is run by Scrum Alliance. Would that be okay? Let us know! @John: Sorry to hear that! May I mail it directly to you? @Don: I am already working on version 2 of the PDF, and appropriate/acceptable answers are at the core of that one. It would be interesting to see what you would consider appropriate/acceptable answers to each of these questions.